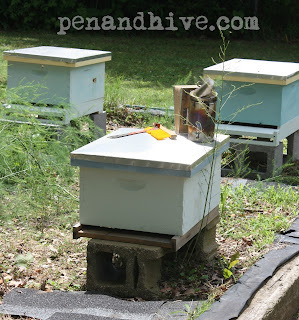 Before I started keeping bees I read a lot of books and went to a lot of beekeeper meetings. I had a pretty good grasp on how to manage bees and what they are likely to be up to at certain times of the year. Or so I thought. A colony of honeybees is the most organized collection of females on the planet and that's why sometimes they can change their minds. Which is exactly what happened a couple of years for the first time. 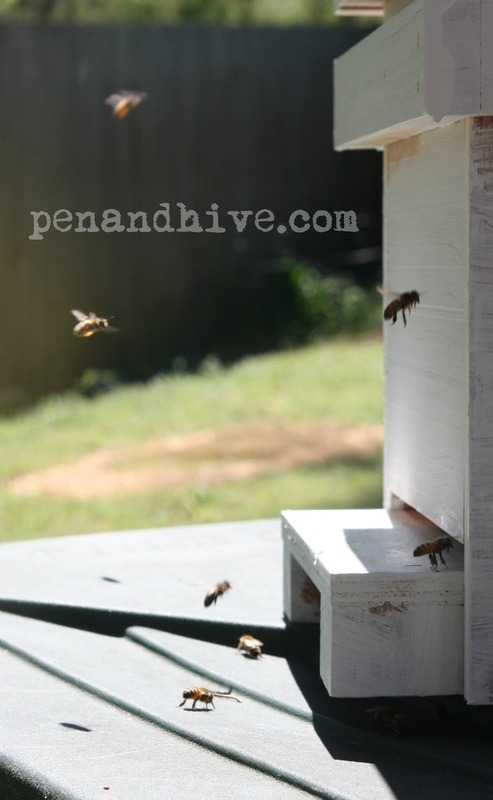 I was in the beeyard around lunchtime when one of my hives swarmed. I figured I'd lost them since they were high in a neighbor's oak tree. 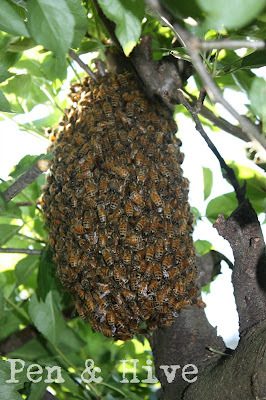 In the evening while I was working in the garden I heard a swarm (you usually hear a swarm first) but I was thinking it was completely the wrong time of day for them to be doing that. I watched while they returned to the hive from the tree. I had the same experience this spring. 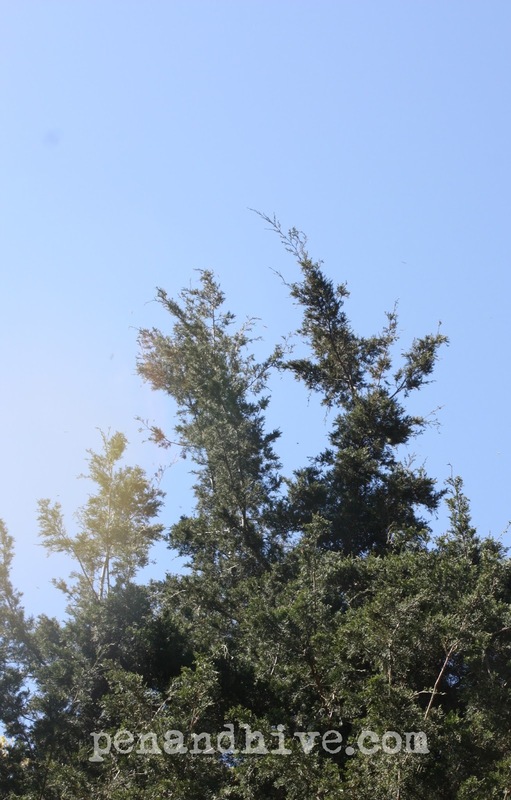 The girls swarmed and headed to this cedar tree by the potting shed. 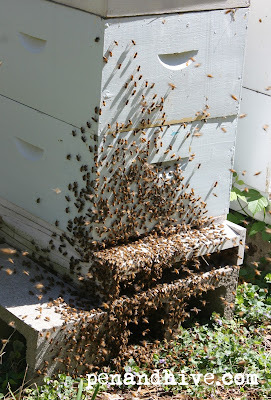 My husband, who happens to be the best beekeeper assistant ever, dragged the trash can over to it and I placed the nuc on top. I baited it with lemon grass oil. 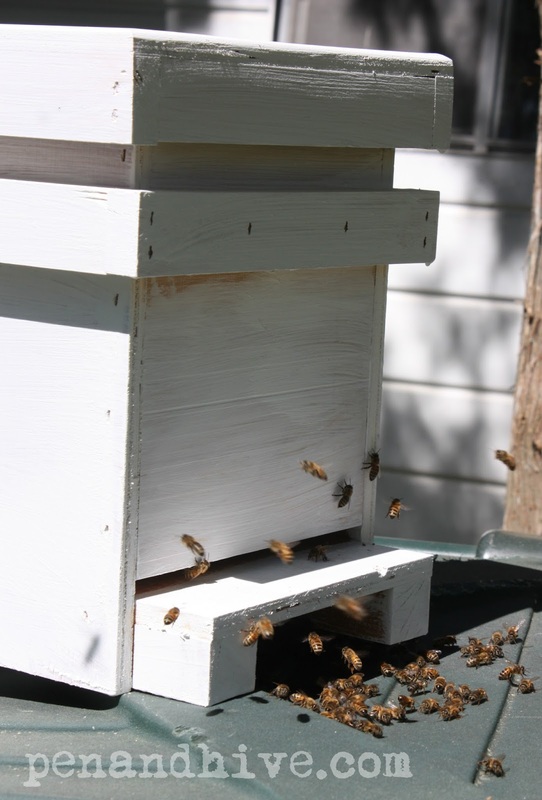 A nuc is a small version of a hive. You put the nucleus of a colony inside to get them started, hence the name. The bees were pretty interested and I was stoked about not having to be on the roof trying to figure out how to catch them. As more gathered I began to think it might work. It was a warm sunny day on the scent of the lemon grass oil wafted through the air. I was so engrossed in getting these photos that at first I didn't realize that the number of bees interested in the nuc was dwindling. 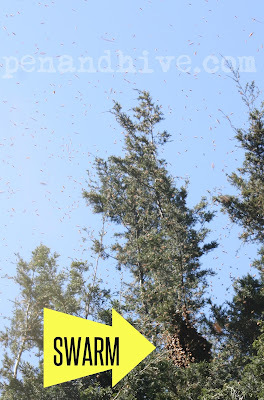 While I was wondering if they had decided to stay in the tree I caught a glimpse of the hive they'd come from. They were returning! I went back to the cedar to see if the swarm was still there. Sometimes when the air is filled with thousands of bees it takes some observation to find out what is actually happening. The swarm was completely gone! 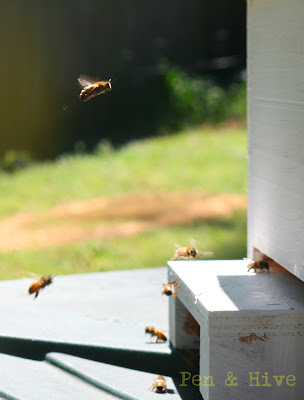 They had returned giving me a chance a couple of hours later to split the hive and trick them into thinking they had swarmed (at least this is what beekeepers think) and start them off in a new hive in the new apiary at my neighbor's house. So why would the bees do this? This phenomenon can occur for several reasons. The queen doesn't lead a swarm, she leaves with the swarm. If they swarm and she doesn't accompany them for some reason they'll come back. She could also have been killed somehow during the swarm. It's also possible that the new virgin queen flew out on her mating flight and the bees got excited and left with her, returning when they realized it was a false alarm. Whatever the reason you can bet that it is one happy beekeeper who can just split (divide the colony in two) the hive instead of wrangling a swarm. This colony is doing great in their new home! About a week later another hive did the same thing. I also caught two swarms and those four colonies make up the new apiary, Margaritaville. Surely they won't ever want to leave, right? The name will make sense in a future post.